On Ontologie Entre Vifs offer a selection of live recordings culled from sessions from their Noisecraft Workshop in Alfortville, France between 2013 and 2015. Entre Vifs are represented by the term "bruitisme lyrique" which translates as lyrical noise. The duo behind Entre Vifs, Jean-Marie Onni and Zorïn, appear to be a part of a collective around Le Syndicat. Both members have been or are still part of the long-running French group active since the first wave of industrial music. Ontologie is their second release to feature on Aussaat following the tape release of Kohle+Stahl which launched the label in 2016. Ontologie features a deluge of machine and mechanical noise cutting between crashing percussion, sound shudders, whooshes and whirs all rendered by sound processing. It's an unrelenting massive sound where elements crash, clash and collide. The five tracks captured here stretch from 8-minutes to 24-minutes. It's not an easy listen, by any reckoning. 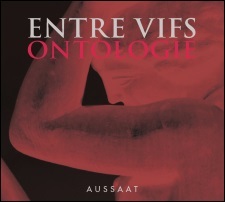 Entre Vifs don't even consider themselves a noise group even though they have their roots in industrial music and the sound of Ontologie is firmly rooted in noise. Layers of massive noise. And yet within the transformation of sounds, the duo of players aren't really the authors. Entre Vifs derive their sound from small noise generators which are subject to processing via numerous homemade devices. The results are a symphony of noise. Entre Vifs aren't dealing with improvisation or composition as such, nor music for that matter. It is the chaos of sound the duo cultivate bringing with it a sense of surprise in the random and chance elements the experiments throw up. The machines and processing acting almost a some sort of third mind. Entre Vifs - and the label Aussaat, owned by Will-i Stasch of The Feverish magazine and the Cthulhu Records label - can trace their roots back to the earlier form of industrial music. But while industrial music has succumbed to genre tropes, Entre Vifs have stuck steadfastly to their vision of bruitism. The effect of Ontologie is like listening to a living sound sculpture, where the noise continually changes shape and transforms. In using home made devices and elements of randomness and chance, the approach of Entre Vifs could I suppose be compared to the early works of Boyd Rice. Ontologie, however, is much more forceful and unrelenting, with sounds derived from a duo of players, utilising more contemporary devices.